"Ms. Hickey does not disappoint! Her enthusiasm for books and reading is contagious. She is approachable and eager to answer questions. We would love to have her visit again!" I love school and library visits! 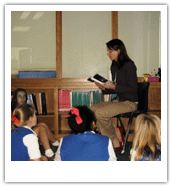 I write fiction for kids of all ages, and can tailor presentations on writing to any grade level. I hold an MFA in Creative Writing from The New School and am an adjunct professor in the graduate writing program at McDaniel College. I enjoy discussing the nuts and bolts of good fiction, how a book goes from paper to publication, and tips to help new writers pursue their craft. For schools, I can do up to three presentations in one day. To get the most out of our time together, I do recommend that students are familiar with at least one of my books before I visit. For libraries, I'm available for readings, workshops, book clubs, and other activities. I also speak to groups of aspiring adult writers about the writing and business of children’s books. Here are some places I've presented in the past. My day rate for local school visits (within 60 miles) is $900. For out of town visits, it's $1200 plus expenses. For information on costs and scheduling, or to request an author visit packet, please email me. References are available upon request.